Halloween Scene Setter decoration Add-ons. Halloween Scene Setter Add-On Decorations from Darkside Displays will allow you to add a variety of scary decorations to your Halloween wall backgrounds and backdrops. Mix and match our scary Scene Setters to create a complete Halloween scene. Scene Setters are giant plastic decorations that can be used to decorate a wall for your Halloween party and can be used in your outdoor Halloween displays. The possibilities are endless. 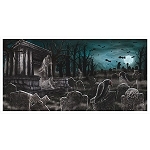 Some of our most popular Scene Setter Add-ons include Cemetery Plastic Banner, Dungeon Decor Giant Decorations, Ghostly Spirits Wall Ghosts Decor, and our Jumbo Morgue Decor.